August — the height (or depth, depending on your point of view) of summer — also is prime season for buying backpacks, new shoes, gluesticks, notebooks, desk lamps, laptops and all manner of back-to-school gear. How much all that shopping adds to the economy, though, is unclear. Which is true, though it’s a bit like saying Bing is the second-most-popular search engine after Google. We looked at several years’ worth of monthly retail sales data compiled by the Census Bureau, excluding certain categories (such as car dealers, home-improvement stores and gas stations) that are unlikely to see much of a back-to-school bounce. It turns out that August is typically the third-busiest month of the year for that group of retailers: Last August, for example, combined sales for the selected group were about $131 billion — nearly $10 billion (or 8.1%) higher than the average for the first 10 months of the year, though well behind December ($186 billion) and November ($144.5 billion). 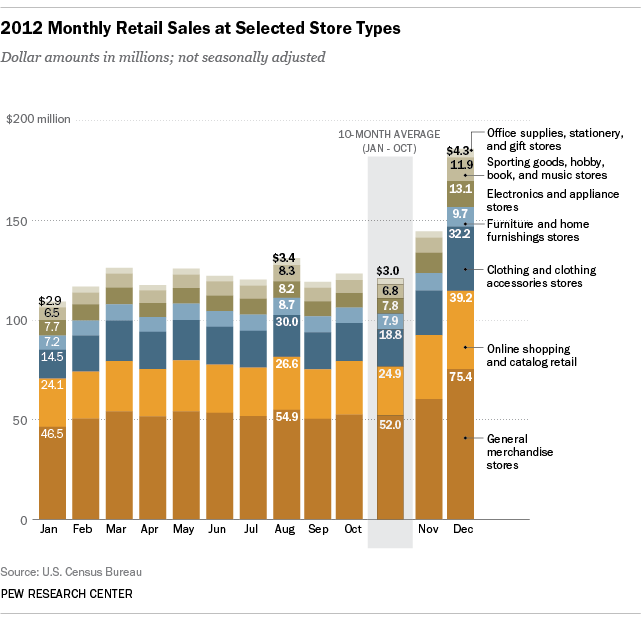 Looking at specific retail categories, August 2012 sales were most above the January-October average at sporting goods, hobby, book and music stores (22.2%); office supplies, stationery and gift stores (13.8%); and clothing and accessories stores (11.6%). The smallest bumps were at general merchandise stores (5.5%), electronics and appliance stores (5.7%) and online and mail-order retailers (6.9%). Last summer, the NRF estimated total back-to-school spending at $83.8 billion. The more modest actual increase of $10 billion last August suggests that, for many families, back-to-school shopping to some extent displaced other purchases. In many states, one phenomenon related to back-to-school shopping is the “sales tax holiday” — a few days during which (usually) specified categories of purchases are exempt from sales tax. This year, 18 states, predominantly in the South, have had or plan to have such “holidays” between late July and mid-August; they’re typically pitched as a break for cash-strapped families and a boost for retailers. Economists and tax-policy experts generally have taken a dim view of sales tax holidays, arguing that they’re, at best, inefficient tax relief and do little if anything to generate additional retail spending beyond what people would have bought anyway. But a 2012 working paper from the Federal Reserve Bank of Chicago, based on an analysis of credit-card purchase data, concluded that sales tax holidays were effective at increasing consumer spending, particularly on children’s clothing and shoes (though the researchers noted that theirs was “a relatively well-to-do sample”).